L: 97" x W: 97" x H: 35"
Artemis II 3-pc. Microfiber Sectional Sofa This Artemis II 3-piece microfiber sectional sofa is so easy to decorate with. Its stone color is what designers are calling the "new neutral." It's not a typical beige, but its deep, slate gray hue will still work with just about anything, even its striking multicolored accent pillows. Plus, this sectional sofa is so comfy to curl up on. This Artemis II 3-piece microfiber sectional sofa is so easy to decorate with. Its stone color is what designers are calling the "new neutral." 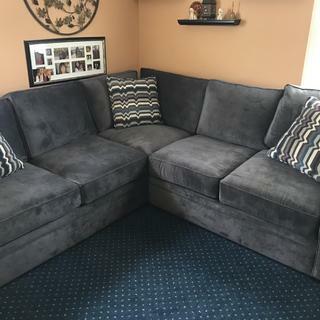 It's not a typical beige, but its deep, slate gray hue will still work with just about anything, even its striking multicolored accent pillows. Plus, this sectional sofa is so comfy to curl up on. Love it! Little stiff at first, but comfy after a few days and perfect fit. It does have a purple hue, so be prepared. I saw some people did not like that. It actually is beautiful and goes with many other colors for pillow/rug coordination! Are seat and back pillows removable? Are they finished on both sides? BEST ANSWER: Yes the cushions are removable and finished on both sides. We are very happy with this couch. It’s a little firm but we like it that way.